Happy Friday morning. Last night’s Congressional Baseball Game was emotional and eventful. Check out all our coverage from the game and the atmosphere at the stadium. Look out for more to come throughout the day. Moving onto the weekend, Sunday is Father’s Day. The Kennedy Caucus Room in the Russell Building was the site Thursday of the ninth edition of the barbecue lunch, hosted by Sen. Johnny Isakson, R-Ga. 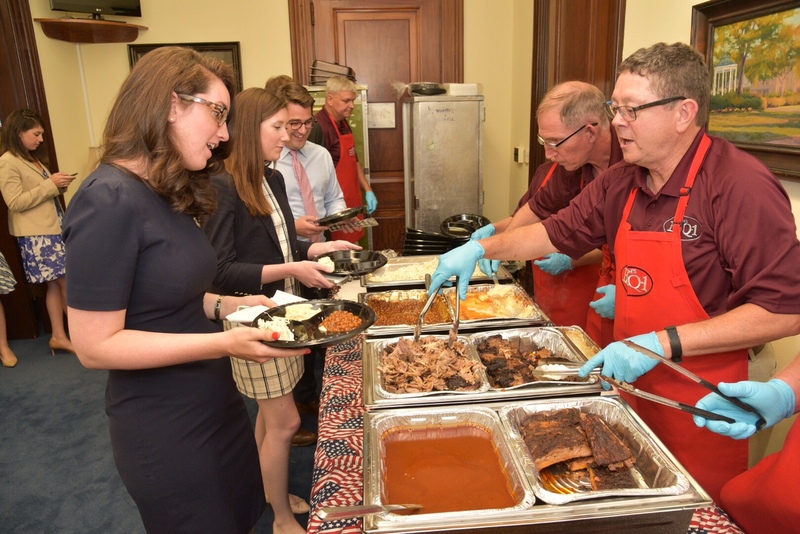 Senators sampled a menu from Sam’s BBQ-1 in Marietta, Georgia, while invited staff, police officers and reporters did the same in Isakson’s personal office, two floors below. On the menu: pulled pork, beef brisket and St. Louis pork ribs, along with baked beans, coleslaw, rolls and macaroni and cheese, as well as Georgia pecan pie from Kenny’s Great Pies. Rep. Jason Smith, R-Mo., 37. Rep. Marcy Kaptur, D-Ohio, 71. Rep. Scott Peters, D-Calif., 59. Rep. Brad Wenstrup, R-Ohio, 59. Rep. Jerry McNerney, D-Calif., 66. Rep. Paul Tonko, D-N.Y., 68.